More than 400 issues were fixed from XWiki Enterprise 1.9.3 to XWiki Enterprise 2.0. XWiki 2.0 introduces a new, lightweight, easily customizable skin. The main goal of the Colibri skin is to provide the proper support for fast and easy modifications of the look and feel of the wiki. See Colibri skin documentation for more details. Themes are indepedent of skins. However currently only the new Colibri skin uses them. Future skins will be made to use Color Themes. 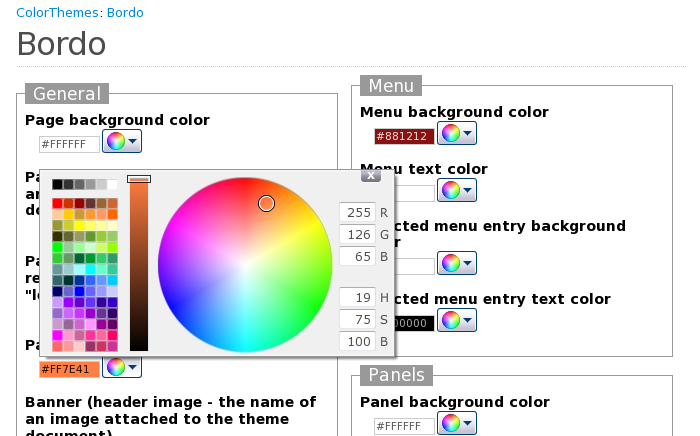 In addition, the Class/Object editor has been modified to use the selected color theme. The document title is now used as the top level header of pages. If no title is specified then it's extracted from the content of the page automatically. This change has been done to all skins: Albatross, Toucan and Colibri. In order not to break existing content we've introduced a title compatibility flag (xwiki.title.compatibility in xwiki.cfg) which when active will remove title duplication if your document has a title and a top level header inside the content with the same name. If you upgrade make sure you modify your xwiki.cfg to use that compatibility flag. We recommend that you modify your pages to always use a title from now on. A panel containing the tag cloud is now provided by default and can be used like any other panel. Section editing now works for any section level. You can configure it using the new property xwiki.section.depth in xwiki.cfg file. By default sections level 1 and 2 can be edited. 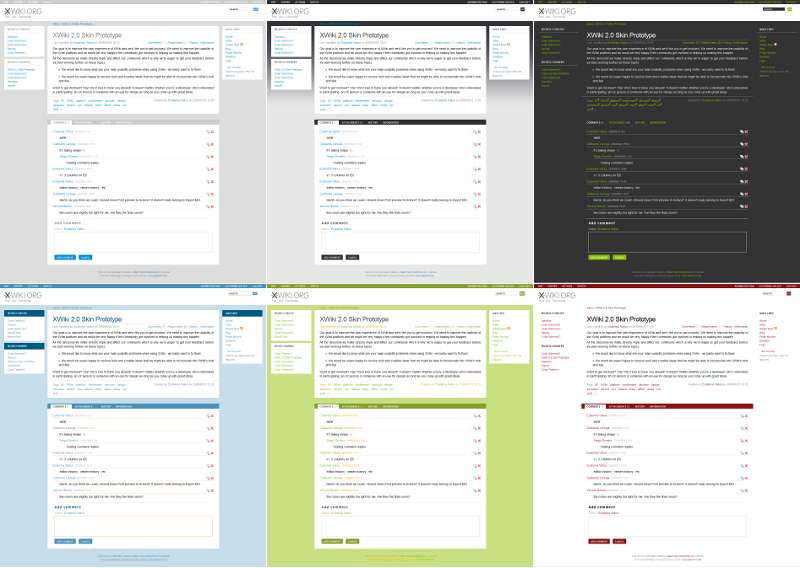 See WYSIWYG documentation for more details. User can now double click on a macro to edit it and double click in the list of macro to insert it. Macro names are now displayed instead of their internal IDs. New Info, Warning and Error macros. New Ruby macro to use JRuby for adding scripts into wiki pages (same binding as for the existing Velocity and Groovy macros). Note that the ruby macro is not bundled with XWiki Enterprise by default. You can download it in the Ruby macro sheet. New Python macro to use Jython for adding scripts into wiki pages (same binding as for the existing Velocity and Groovy macros). Added ability to transform any wiki content into a Macro. See the Wiki Macro tutorial for more details. It's now possible to add JARs attached to a page to the Script Macro class loader. All the script macros in the same rendering process (a document and it's included documents) share the same class loader. For example this makes possible to declare a Groovy class in a document and use it in other documents which includes it. It's now possible to not parse velocity macro content for wiki syntax by using the wiki="false" parameter. The Table Of Content macro now starts at the first level by default (it used to start at the second level by default). Not all the pages from the default XAR have been converted to the XWiki Syntax 2.0 yet. See Clustering administration documentation and Remote Observation Manager documentation for more details. It's now possible to make different instances of XWiki or other programs shares events. We have introduced a lighter XHTML renderer which avoid having all extra datas needed by the WYSIWYG, thus reducing a lot the size of rendered pages in view mode. JS and CSS files are now compressed. The watchlist feature now supports multi wiki and has improved performances to prevent farm wikis to be stuck when sending all notifications for all wikis (this is done by using the new Activity Stream feature). Renderers are now real components. The same way it's possible to add any parser it's now possible to add any renderer for a specific output simply by registering it as a component. See Rendering Module for more details. New plain text parser. 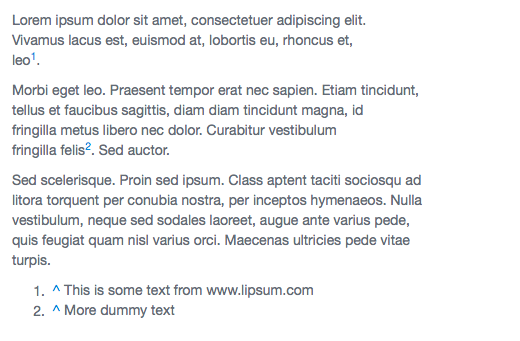 Pain text parser make possible to put in a page some plain text to render it exactly as it. The syntax name of plain text renderer is plain/1.0, you can enable it in xwiki.cfg. New events for XWiki startup/shutdown. It's now possible for a component or a plugin to register to startup or shutdown events. It's very useful when some plugin need to start and stop an external service. The AllDocs page needs to be saved with a user having programming rights to work (otherwise the Attachment tab will show empty results). See XWIKI-4407 for more details. If you were already using the Watchlist you must upgrade the notification intervals in user profiles.